Sherie and Ben had stayed in Cortina during our previous visit to the Dolomites. 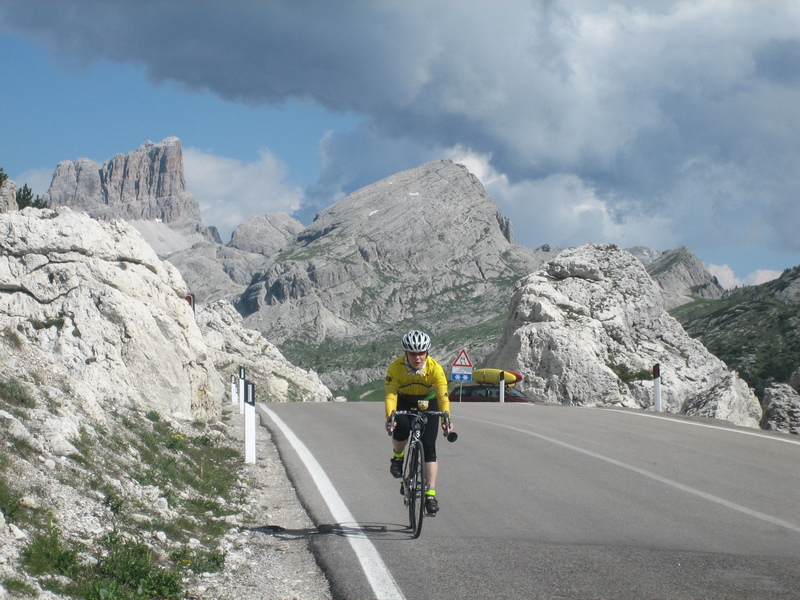 As the second loop of the Maratona passes near there, Ben thought he could lure Sherie to ride to Cortina for lunch and scout the route as well. After a nice light breakfast at our hotel in Corvara, we started southward up Passo Campolongo a bit ahead of two of our hotel mates. They soon caught and passed us, going maybe one kph faster than us up the switchbacks and climbs. 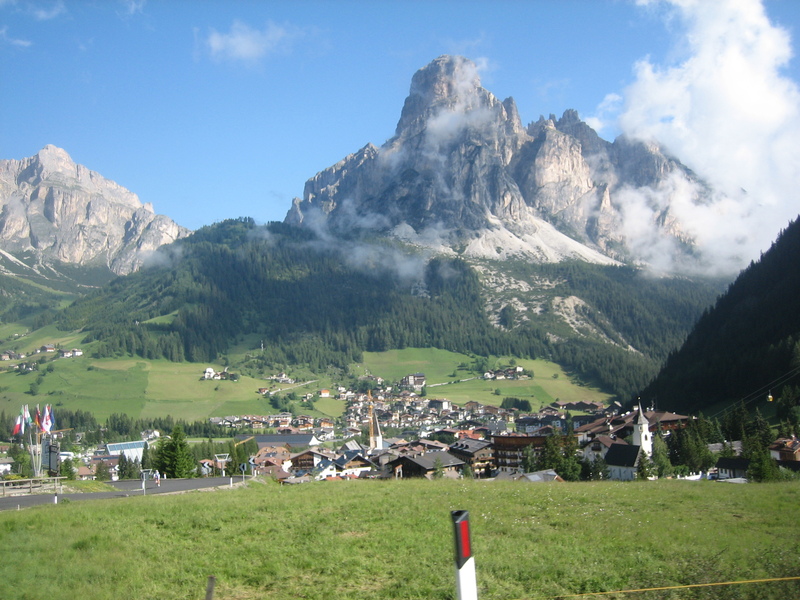 The views back down over Corvara and up to the Sassongher towering over town kept our eyes wandering. Still pretty cool in the morning, we quickly warmed and pushed arm and leg warmers down as we got our bodies into the climb. 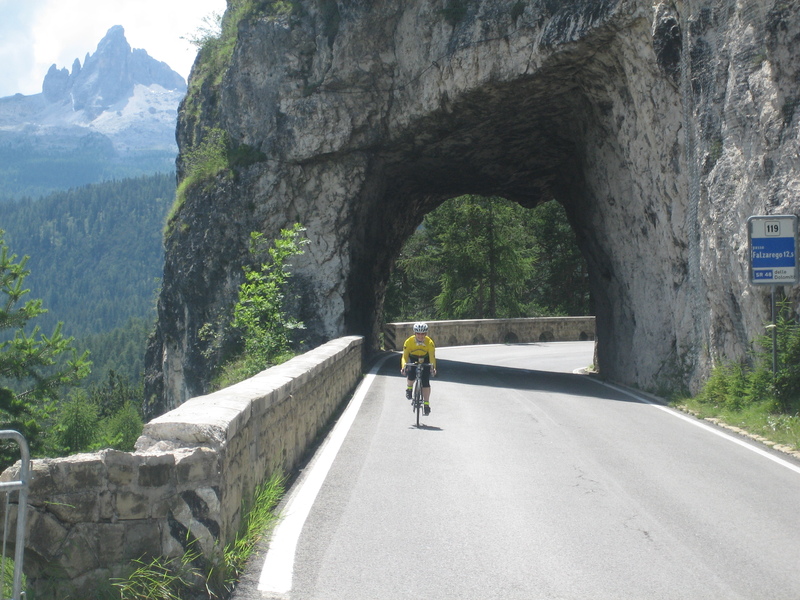 The descent off the south side brought new views on the south of the Selle Groupe and up toward Passo Pordoi. Today we planned to go down the valley, traversing on its eastern slope. As the kilometers ticked by, a rolling road but generally a slight downhill, the Coredevole river and valley floor fell further below us. 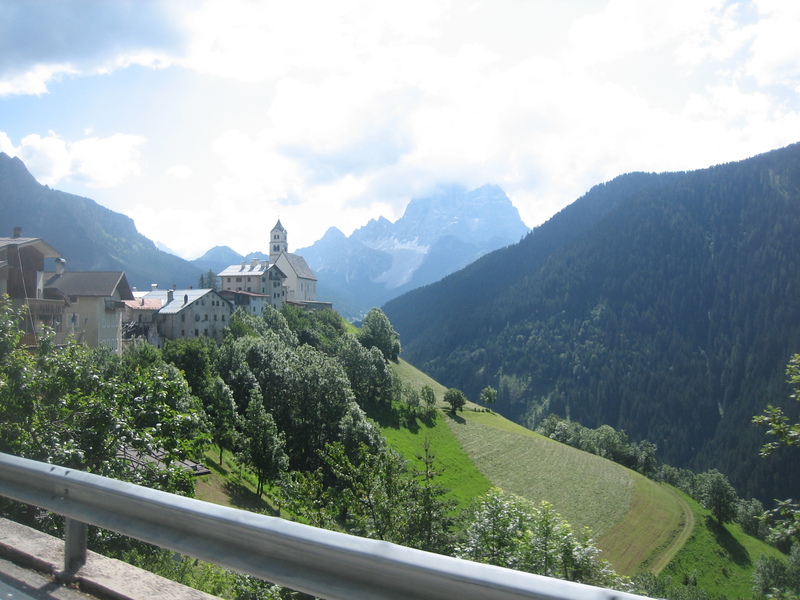 After passing through several villages, we came to the junction of the road up the Passo Falzarego. This is the “medio” route of the Maratona, duly noted by Ben and Sherie but passed by for the next pass. 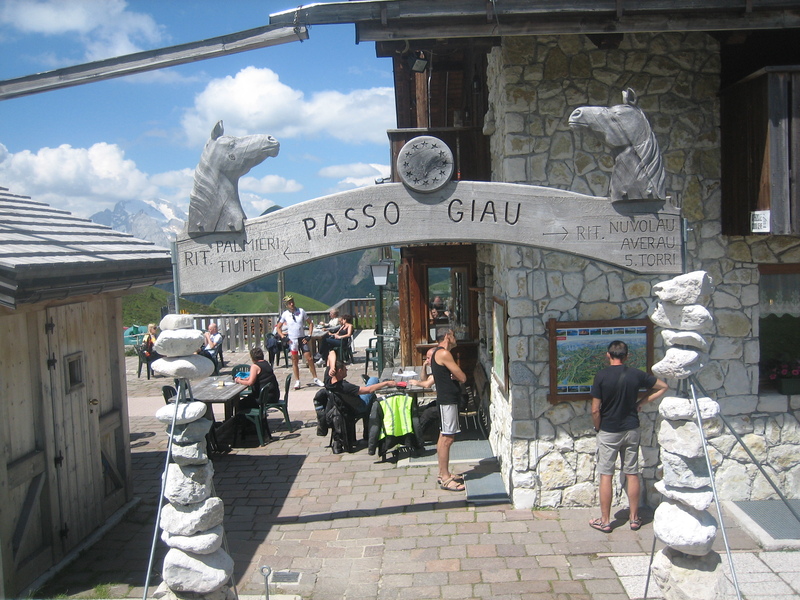 We wanted to climb up the longest, steepest, toughest pass, “the Giau” rhymes with “ou” as in it hurts. 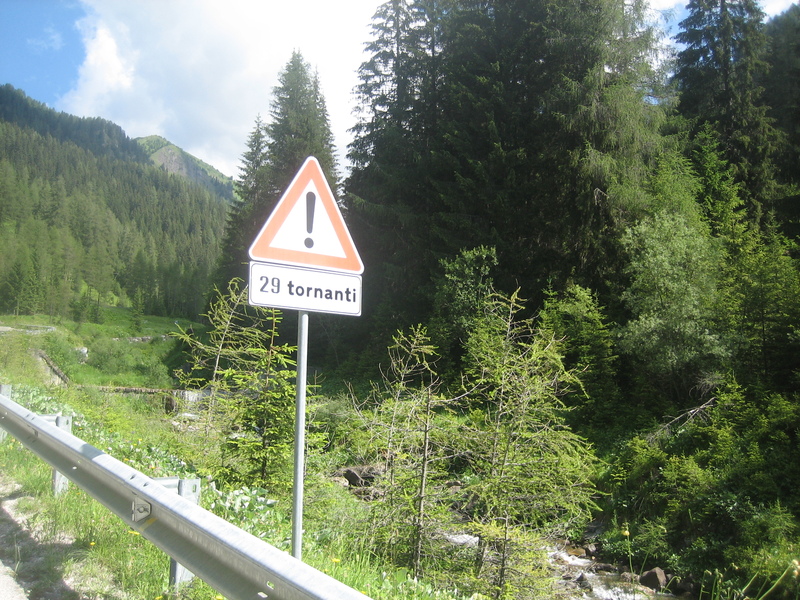 At the bottom of the climb a sign, with an exclamation point, announces 29 hairpins. That, and the known 11 km of distance, would be our countdown to the top. Indeed a stiff climb, it rises at long ramps of at 10%, with very short flatter sections on bridges over the torrent. I mean really short, like 50 meters. Then one turns a corner and it steepens to 12% to 15% sections, easing of so one can “rest” at only 10%. When we broke above the trees at about switchback 17, the views to Mt Averau and La Guselga kept ones eyes looking ahead moving through the cow pastures. Ben felt the sweat pouring off his head as he climbed the last section, traversing and switching back in sight of the summit hut. Here he waited, chatting with some fellow Californian cyclists from Chico awaiting Sherie. It took Ben nearly an hour and a half, Sherie close to two hours, for those 11 km. 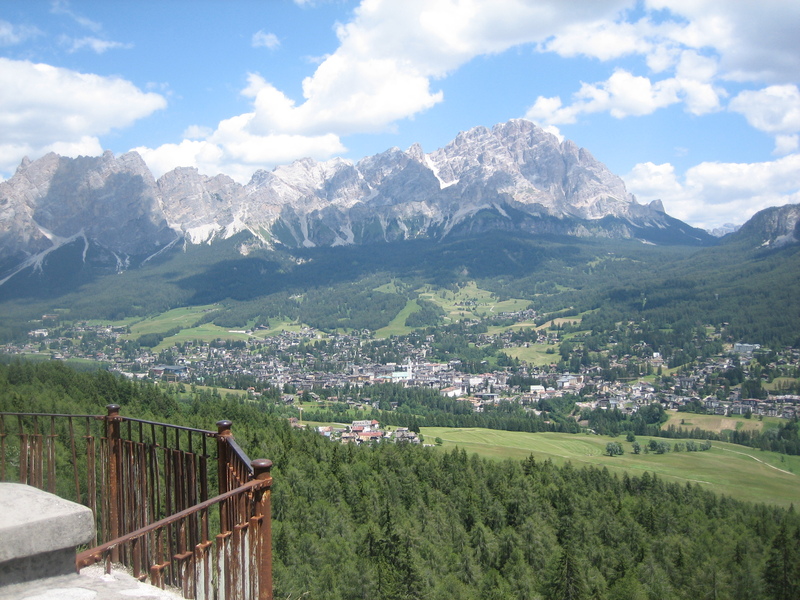 The views from the top were spectacular, down to Cortina on the east, with towering peaks in all directions. The scattered cumulus clouds would occasionally cool us as we cooled off, sipping our expensive cokes. Soon we enjoyed the descent down the east side, passing over the roadway painted with Giro cheers. Ben especially enjoyed the “double-switchbacks” going down. As the road generally traversed downward with the mountainside rising to one’s left, the road occasionally hair-pinned right, then again immediately left to resume the traverse direction. Often the rhythm of the descent was such that one leaned right for the first turn, then immediately left for the second without needing to right straight upright in between. Truly a wonderfully felt g-force. Cortina d’Ampezzo is the largest town in the area, the most sophisticated, the ritziest. Sherie and I made our way off the car loop into the walking street on our bikes near the town church and clock tower. It was great to see the clock, as during our previous visit scaffolding had obscured it for renovations. Ben remembered a way up off the street/square up toward the old train station (now bus station, as the tracks are removed and made a bike path) where we had a favorite pizza place. A group of about twenty mountain bikers had parked all over, and we sat on the street veranda were we could watch the scene and our bikes. The food as good as remembered, although the help a bit aloof. The climb out of Cortina back up the east side of Passo Falzarego was steady at first, to the junction of Giau at Pocol. After a bit more steady climbing (7% to 8%) were a few kms of nearly flat where one could either relax or push the pace. A couple more kms of 8% brought us close to the pass, where we passed the Italian army encamped for training. Many machine guns, backpacks, and loafing soldiers stood as sentinels to our steady climbing. 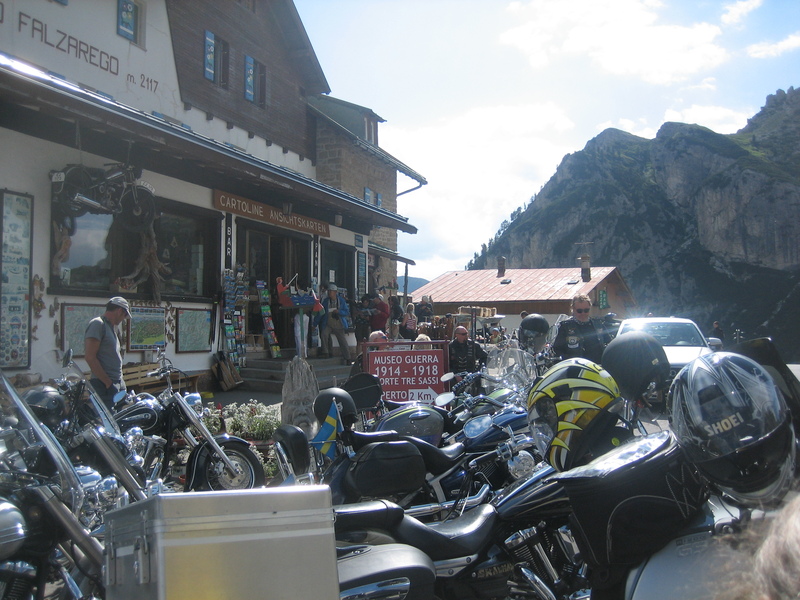 Another km saw us to the summit, with it kitsch shop, cafe, busloads of tourists, hoards of motorcyclists, and dozen relaxing bicyclists. Truly one of the “see and be seen” spots of the Dolomites. After Ben cooled down waiting for Sherie, and Sherie cooling down with ice cream, we climbed a bit more northward to Falzarego’s sister, Passo Valparola. Both passes feature memorials, and debris, to the horrific fighting here during WWI as the Italians and Austrians fought for the strategic high points above these key passes. The views are huge, spires in all directions with distant sightings of the glaciated Marmolada to the south. 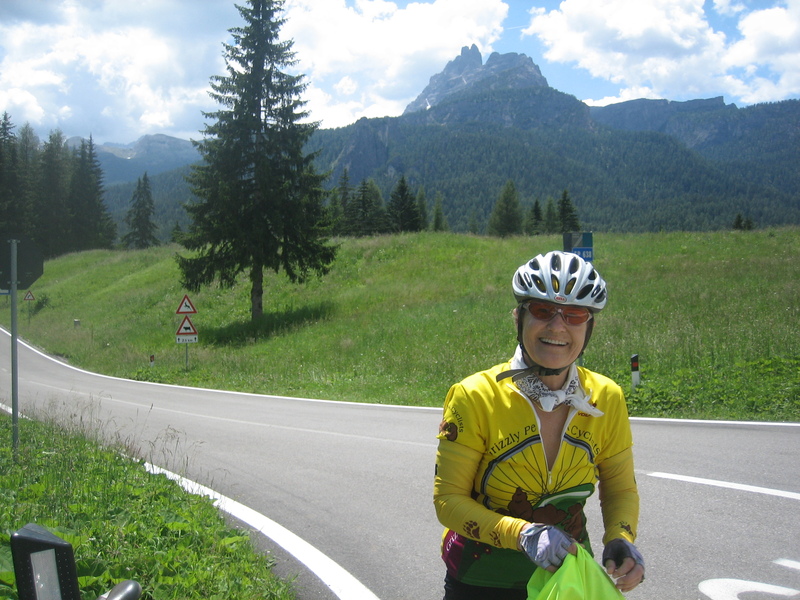 A nice fast descent brought us to La Villa, where a short easy climb brought us home to Corvara. We particularly enjoyed our evening meal at Albergo Pradat; the waitress sisters dress in local costume for dinner. 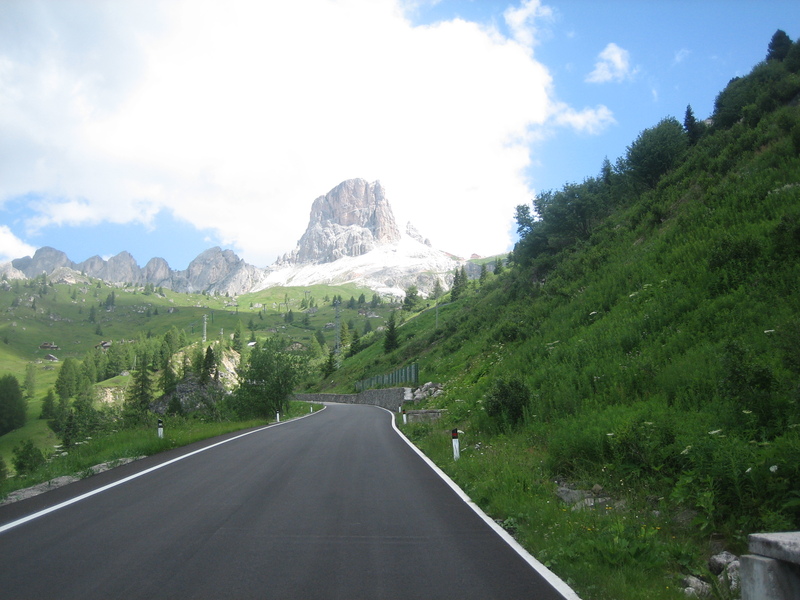 One commended us on going to Cortina for lunch; she was even more enthused when she found we had gone the long and hard way over Passo Giau. At dinner (and breakfast too), one must be careful to not overeat here, again, as there are many treats to tempt one. Salad bar, followed by appetizer (melon and prosciutto), followed by first course (pasta or soup), followed by second course (meat with potatoes), followed by dessert (torte or such, fruit salad, ice cream or some combination). Sherie and Ben had purchased a bottle of local Alto Adigo red wine; with our exertions it will last three dinners. Quite drinkable, a bit lighter than our big California wines, but a nice round fruit flavor that mellows the tongue. They leave it at our assigned table to consume at our own pace. Wow. What glorious scenes. You look radiant and happy.